HomeStrong Fundamentals: Ready To Be Loved? Strong Fundamentals: Ready To Be Loved? 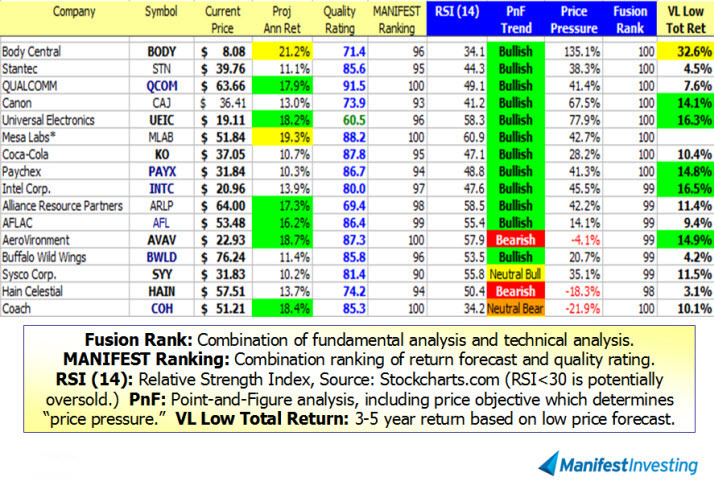 This month features the top percentile of all stocks covered at MANIFEST on the basis of a combination of strong fundamentals (return forecast and quality) and some key technical factors (relative strength index, sentiment and momentum). 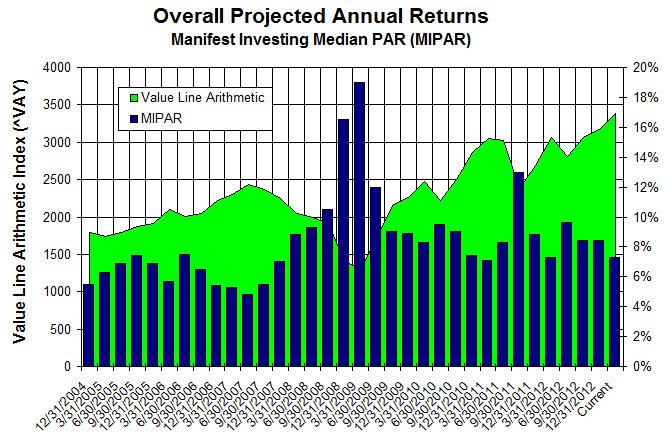 The median projected annual return (MIPAR) for all 2400+ stocks followed by MANIFEST (Solomon database) is 7.2% (1/31/2013). The multi-decade range for this indicator is 0-20% and an average reading since 1999 is 8.5%. O Cupid, Doth Thy Arrow Sting? With Valentine’s Day around the corner, Body Central (BODY) a specialty retailer for ladies from 18-35 might be worth a closer look. Be diligent. This one is down to $8 from $30 and has recently changed management while harvesting a weak quarter or two. It could be a value trap … or an oversold opportunity. From our vantage, we’re hoping it’s Chicos II. Qualcomm (QCOM) is always a worthy study and a well-diversified supplier to a number of the combatants in the smart phone and tablet wars. I still remember Christmas break 1999 when our largest holding at the time, QCOM, soared at an incredible rate. The January Round Table audience selected AeroVironment (AVAV) following a brief summary and nomination by Ken Kavula — one of our leading knights on a relative return basis since inception. Super Bowl weekend. Do you know where the remote is? Study Universal Electronics (UEIC). You can order a new one if needed.